A monument to the victims of the Jeju Uprising at Jungmun. Every summer, thousands of South Koreans, Chinese and Japanese tourists flock to Jeju Island for its beautiful beaches and natural beauty. But social justice activists are trying to get them to also visit sites that explore the island’s dark history, and commemorate the victims of anti-communist massacres that began prior to the Korean War. 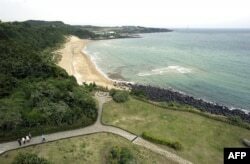 Today, Jeju Island, also known as the ‘Hawaii of Korea,’ is a world heritage site known for its fields of yellow canola flowers in full bloom, the bright turquoise color of the ocean, numerous waterfalls, and natural wonders such as the fortress-like Seongsan Ilchulbong cliff with thousands of volcanically formed cones rising out of the ocean. However, in 1948, Jeju was the site of a violent pro-communist protest movement against the U.S. allied South Korean government that grew into a separatist uprising. Pro-communist demonstrators held rallies to oppose a May 10, 1948 election that would affirm the division of Korea between the communist North and capitalist South. On April 3, 1948 rebels attacked police stations, killed officers, and burned polling centers for the upcoming election. The government in Seoul declared martial law to suppress the insurgency. Thousands of police and pro-government militias from the mainland took part in a widespread and brutal crackdown that lasted until the end of the Korean War. A 2003 South Korean government truth commission report found government forces responsible for widespread atrocities, including burning down 70 percent of all villages on the island and killing more than 30,000 people, or 10 percent of the island’s population. “People were killed without reason. Anyone could lose their life. Whether or not it was a baby, disabled, pregnant, or elderly, there was no exception. They killed anyone that came into sight,” said Hong Chun-ho, a survivor of the so-called April 3rd Incident, who is now 81 year old. Today a civic group operates Jeju Dark Tours to raise public awareness about the island’s tragic history, and what it sees as the unresolved issue of the South Korean government involvement in the killing of thousands of innocent people. “It is crucial to deliver the message that we will no longer keep silent against the state violence and that we won’t let this happen again,” said Baek Ga-yoon, a representative of Jeju Dark Tours. The tour takes visitors to see the site where alleged executions took place, a mass grave of victims that is part of the April 3rd Peace Park, and caves where villagers would hide to evade police and military forces. Critics of the South Korean government’s role in the Jeju conflict also hold the United States accountable as well. They accuse the occupying American military power of either directly supporting or allowing the crackdown. 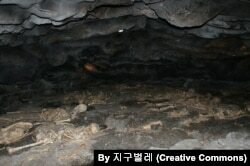 The U.S. military has denied any involvement in the atrocities committed on Jeju Island. Some supporters of the U.S.-South Korea alliance are concerned that the Jeju Dark Tour group is not about understanding the past, but about advancing an anti-American political agenda. “The education and tours regarding the April 3rd Incident could be implemented with a purpose to provide negative perspectives on the U.S. military and to disrupt the U.S-South Korea alliance leading to the withdrawal of U.S. Armed Forces, which would be very mistaken,” said Kim Kwang-dong, a security analyst with the Nara Policy Institution in Seoul. So far neither the Jeju Dark Tour, nor the sites commemorating the tragic history of the island, have become popular tourist attractions. In 2017, only 2.3 percent of Koreans visited Jeju Island for cultural or historical educational purposes, according to the Jeju Provincial Tourism Association. The Jeju insurrection and crackdown remains a controversial subject in South Korea. Some conservative advocates argue the tragic loss of innocent civilians was justifiable in a time of war, and to prevent the spread of communism. The more liberal perspective focuses on the atrocities committed by government forces, and downplays the communist leaning of the insurgents, instead referring to them as freedom fighters who stood against the division of the Korean peninsula. For decades the South Korean government suppressed and censored information about Jeju’s dark history. There were even cases where the descendants of the participants in the uprising alleged they were discriminated against in gaining employment, and where authors who wrote about the incident were imprisoned. In 2003, after a long silence, the Korean government officially apologized for its role in the massacre, but victim advocates also have demanded compensation. This year, South Korea’s liberal President Moon Jae-in, who is sympathetic to the cause of the Jeju victims, voiced support for seeking reconciliation about the April 3rd Incident through dialogue and education. “Although the tragedy was prolonged and the pain was so deep that a breeze only brought tears, the spring of Jeju will blossom like a full bloom,” said President Moon Jae-in at this year’s memorial ceremony.